Euclid, the ancient Greek mathematician, may have been the first to grasp the significance of perfect geometric solids like the icosahedron and tetrahedron. The challenge of drawing the human hand, together with the challenge of drawing these classic shapes, is one of the finest exercises in art. The beautiful flowing form of the human hand stands in dynamic counterpoint to the crisp, geometric lines of the cone, sphere, and other geometric forms it grasps. 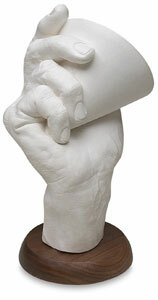 Human Hand Stands are life cast in hard plaster from a large male hand. The custom wooden base is removable for multi-angled viewing.